Seventeen year old, Armani Radnelaq a full blooded BaSatai is plagued by a curse in her blood. A curse created from hate and designed to break the divide between two parallel worlds of Earth and H-trae when Armani’s blood is spilled in attack and she dies.S’teuqoubs have been travelling back and forth across the divide for centuries without trouble. The BaSatai and Guardians monitoring activity and enforcing rules to ensure peace and harmony but if the divide splits and opens, a much greater number of supernatural S’teuqoubs will filter into earth destroying equilibrium which the BaSatai and Guardians will be unable to control. Humanity and the BaSatai will suffer and perish. The parallel divide must remain secure at all costs.Armani has remained hidden on earth with her adopted father Elijah since her birth. She has been raised in the human way and fights her natural instinct to evolve into a BaSatai. The BaSatai in her requires her to evolve and shift, use her powers and strength. Yet Armani is freaked out by the need to shift. She smokes, has a bad attitude, must deal with aggressive bullies and control her natural BaSatai instinct. Her Guardian with BaSatai Warriors are coming for her. She refuses to accept her fate and doesn’t believe any BaSatai should die to protect her. Couldn’t find a book trailer, so here’s a video! Are you a fan of The Vampire Diaries (The show), Harry Potter and fantasy? 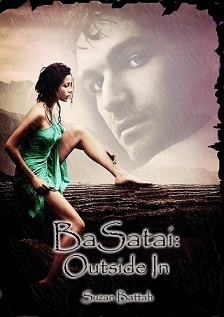 Then you’ll probably enjoy BaSatai: Outside In…just saying of course. Thumps aside, as the novel progressed I was actually pretty surprised by Armani took being told that she had to cross the Divide and not die so that the curse in her blood doesn’t, you know…kill everybody. Though when we were first introduced to Armani, we ended up meeting the Primpers who are your typical *angry face* popular girls. Not only do they end up insulting our lovely main character and our MC’s Daddy, but they also start flirting with the MC’s man!! Not cool girls, not cool. Since we are on the topic of Armani’s “man” let’s just throw the review into the direction of the BaSatai part of the novel. The main group of BaSatai the novel gives us are Jayani (who kind of reminds me of Alice Cullen), Karhl and Rafael. While Jayani came off as a wise-cracking-sidekick, Karhl and Rafael are the two characters you want to pay the most attention to. Karhl being Armani’s Guardian and Rafael being Armani’s boyfriend? I’m not exactly sure if you can call him a boyfriend, but the point being that he and she do have a romantic relationship. Was it realistic? Yes. Was it cheesy? No. Did I enjoy it? Yes, yes I did (even though Rafael does act like a bit of an angry control freak). As for the BaSatai in general (did I forget to mention the part where I still don’t really know if I’m pronouncing BaSatai properly?) they sounded like mutated Kryptonians!!!! And for those of you who don’t know what that means I’ll give you the translation: The BaSatai are more powerful, invulnerable and basically the opposite of everything us humans are (ergo Kryptonians). Another fun little fact is that I popped out my Riddler skills again to figure out what the BaSatai were saying in their nifty BaSatai language and if you want to know the secret then here it is: It’s all backwards English! Very smart Miss(es) Battah, very smart *waggles finger*. Besides the plot I found that the novel’s writing style was very descriptive and really explained just what Armani was feeling exactly. I could easily form the setting and characters easily in my head as well as give the characters voices to fit their personalities. The only issue I had was that *giggles* I kind of noticed that there was just a little bit too much profanity, I mean I’m a teenager and I’m pretty sure we don’t drop the F bomb every second sentence. Maybe it’s only the BaSatai that do it? *shrugs*. Other than that, a real good read that ends on a high note, practically setting itself up for a sequel! Thank you so much for your honesty, so glad you enjoyed it and your feedback is very welcome.